Lunar New Year is the beginning of a the lunar calendar and is based on the cycles of the moon. Therefore it often falls sometime between the middle of January and the middle of February. It is celebrated in many places all over the Asian continent. Some celebrations include fire works like we see during the new year our Gregorian Calendar is based on. But aside from celebrating a new year, the Lunar New Year is often closely tied to family. Here are some examples of how Lunar New Year is celebrated in different countries! In China, they celebrate the Lunar New Year with a festival called the Spring Festival in mainland China. The first day of the Lunar New Year begins on the new moon that appears between the 21 of January and the 20 of February. Traditions include reunions with family (as the holiday has strong ties with honoring family), cleaning the house, firecrackers, food, and receiving money in red envelopes. 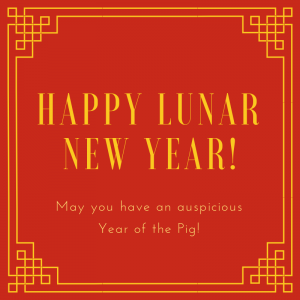 The traditional greetings include “Gong xi fa cai” which translates to “May you have a prosperous new year” and “Gung hay fat choy” which is Cantonese for “Wishing you great happiness and prosperity.” Each new year is also accompanied by a new sign of the zodiac, this year’s sign is the pig. In Korea, the Lunar New Year is called Seollal. It is also a national holiday that is closely tied to family. In Korea, the days right before and right after Seollal are often holidays as well (meaning many businesses are closed) so that people can go back to their ancestral homes/hometowns to pay respects. It is also a day that people eat a traditional food called tteok (a rice cake) which will add another year onto their life (people in Korea count themselves one year older on new year’s day). When home, children will bow to their elders and receive money in return. The traditional greeting in the new year is “Saehae Bok Mani Badeuseyo” which translates to “May your new year be filled with blessings.” Korea, like China and many other Asian countries, also considers this the year of the pig according to the zodiac cycle. In Vietnam, they call the holiday Tết short for Tết Nguyên Đán which translates to “Feast of the First Morning of the First Day.” A fun fact is that sometimes Vietnam celebrates Lunar New Year on a different day than China. This is because sometimes the one-hour time difference between Vietnam and China results in new moon occurring on different days. The traditional greetings are “Chúc Mừng Năm Mới” which means “Happy New Year” and “Cung Chúc Tân Xuân” which translates to “gracious wishes of the new spring.” Like in China and Korea, Vietnamese families also celebrate by cooking food and cleaning the house. There are many other versions of the Lunar New Year celebration that take place all over the world! Definitely check them all out and we hope you have an auspicious and lucky new year!